September 10, 2018, 10:24 a.m. The latest development in the aftermath of an anonymous article detailing a resistance movement in the Trump administration has seen the White House suggesting staff take lie detector tests in order to find the culprit. Vice President Mike Pence, upon who some speculation has fallen, has said that he would take a lie detector test “in a heartbeat” in order to prove that he did not pen the op-ed. But how confident are people that a polygraph test would correctly identify the culprit? New YouGov research reveals that four in ten Britons believe that lie detector tests are either “very” effective (4%) or “quite” effective (36%) at determining whether or not someone is lying. By contrast, just over a third of people think such tests are “not very” effective (28%) or “not at all” effective (9%), with the remaining 23% saying they don’t know. Those most likely to believe in the accuracy of polygraphs are Conservative and Leave voters, with 46% among both groups saying they believe the tests to be very or quite effective. By contrast, this figure is 36% among Labour voters, 34% among Remain voters and 21% among Lib Dem voters. The youngest Britons (18-24 year olds) are the most likely to be sceptical of polygraph test results, with 49% believing them to be either “not very” or “not at all” effective. Whether or not the results of polygraph tests are admissible as evidence in court is decided by the individual states in the USA, but here in the UK – as well as in many other countries – there is a blanket ban on using them as lie detectors are not considered to be reliable enough. 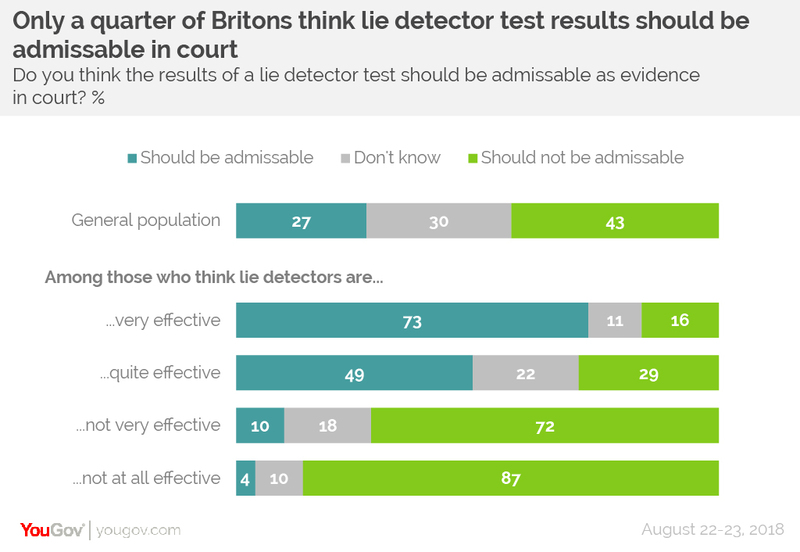 That being the case, do Britons believe that results from lie detector tests should be admissible in court? Only a quarter (27%) do, including 73% of those who think they are polygraph tests are “very” effective and 49% of those who think they are “quite” effective. By contrast, 43% say the results of such tests should not be admissible, including 72% of those who think they are “not very” effective and 87% of those who believe they are “not at all” effective. The remaining 30% are unsure.